Do your value education through adventure and hands-on experience? JOIN THE ADVENTURE EDUCATION COMMUNITY! Registration: email tanya.barnett@wsu.edu; after you register, you will receive a confirmation packet that includes directions and additional training details. Cost: $150 – includes materials, daily lunch, and instruction fee. After course completion, new facilitators may receive a discount on the future use of the Gibbs Lake Low-Ropes Challenge Course. 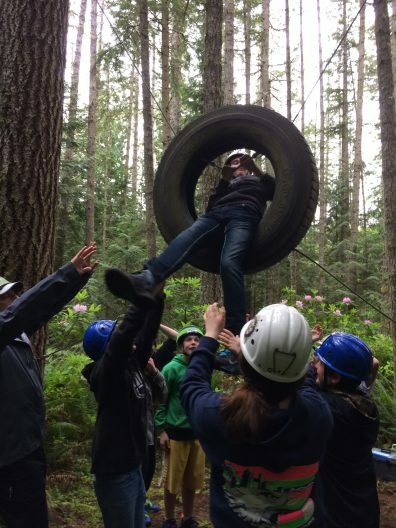 More Information and scholarship inquiries: please contact Tanya Barnett at tanya.barnett@wsu.edu or 360-3795610 x208; click here to link to our 4-H Challenge Program page to learn about our Gibbs Lake Challenge Course. Extension programs and employment are available to all without discrimination. Evidence of noncompliance may be reported through your local Extension office. Reasonable accommodations will be made for persons with disabilities and special needs who contact Tanya Barnett, Jefferson County 4-H Coordinator at (360) 379-5610 x208 or tanya.barnett@wsu.edu at least two weeks prior to either training.